It's back! Six years after the 140 Foot Telescope retired from service as an NSF user-instrument, the largest equatorial telescope in the world is back online as part of a collaborative project with MIT. 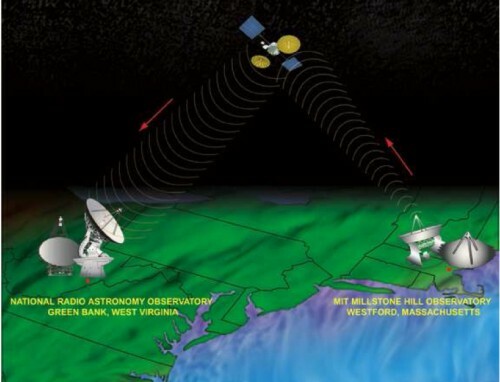 The Massachusetts Institute of Technology's Lincoln Laboratory and NRAO are collaborating to study turbulent properties of Earth's Ionosphere. 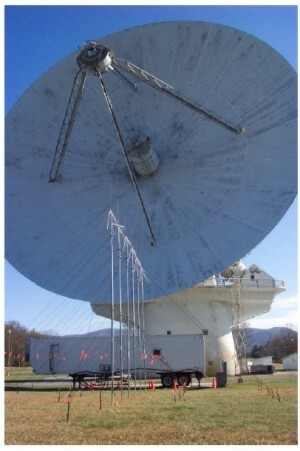 Note the row of discone antennas in front of the 43 Meter Telescope, used in a parallel experiment to detect FM radio signals, backscattered off the ionosphere. Initial testing of the 43 Meter Telescope. The service tower is to the left and the 100m diameter GBT is in the middle background. 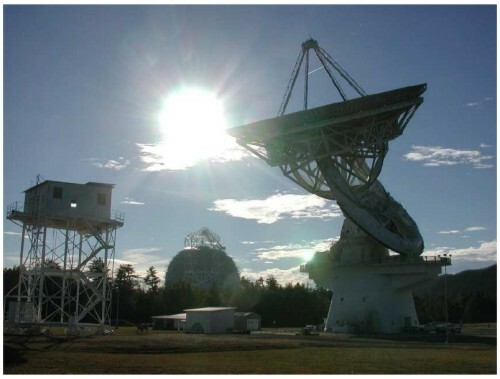 Bistatic radar observations of spacecraft are conducted between the radar station at Millstone Hill Observatory, and the 43 Meter Telescope in Green Bank.